At Aquamist, we are proud to serve Victoria with our team of professional mattress cleaners. Unfortunately, mattresses provide the perfect environment for all kinds of unseemly microorganisms. Not all of these are harmful, but still the idea of climbing in to an infested bed is a somewhat unsettling one for most of us. Our mattress cleaners armed with the hygienitech mattress cleaning system can quickly and easily sanitize your bed and clear away microscopic threats to your health. The fact is that many of us could be sleeping in unhealthy conditions every night. 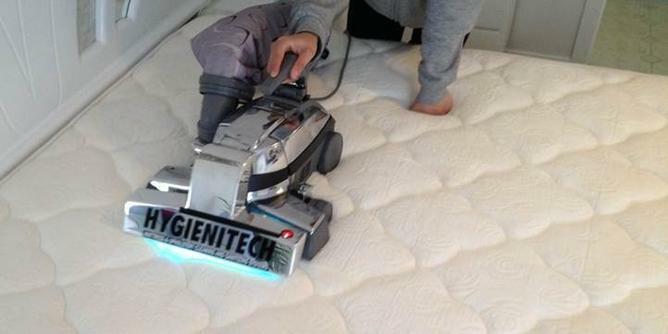 A fast and thorough mattress cleaning with our Hygienitech method will safely and proficiently sanitize one of the most important places in your home. Dust mites don’t look very friendly when you see them under a microscope, but they aren’t as scary as they look. They are not harmful in and of themselves, they don’t carry disease and they live off of the skin cells that we shed naturally. For people suffering from allergies though, these bugs can be the source of more than a bad case of the heebie-jeebies. Their droppings and dead bodies can exasperate their problems and cause increased asthma attacks. Bed bugs are a different story. They are dangerous parasites that feed on the blood of their hosts and they can cause major problems whether you have allergies or not. Once rarely heard of outside of nursery rhymes, bed bugs have experienced a highly publicized resurgence in recent years. Unfortunately, their numbers seem to be growing. We don’t have to succumb to the nightmare of bed bugs, though. Our professional mattress cleaners use the proven Hygienitech system to eradicate these tiny pests. As a matter of fact, not only is it effective it is also environmentally sound. No chemicals of any kind are used, instead a powerful UVC light actually destroys the genetic makeup of microorganisms. This is the same method used to sanitize equipment in laboratories and hospitals. It is safe for your whole family. For more information about Hygienitech, visit their website.